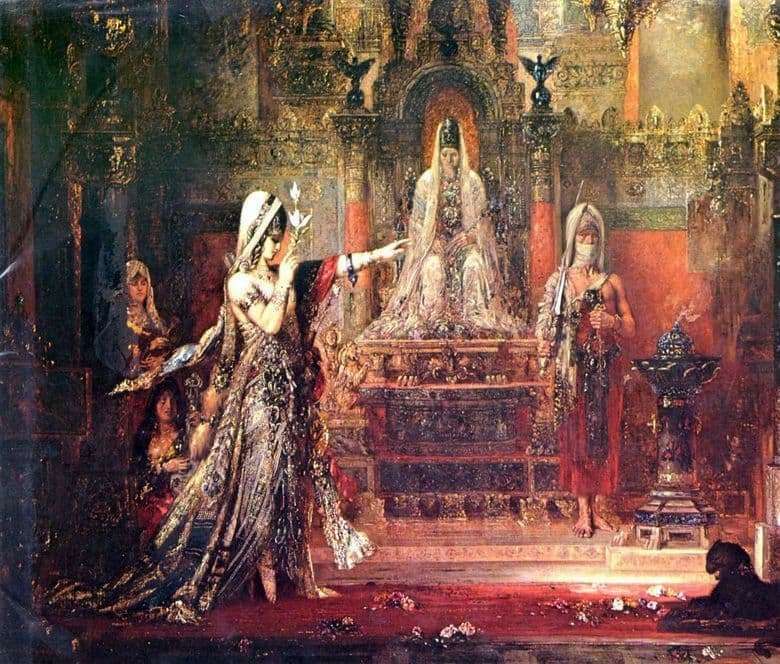 On Gustave Moreau’s canvas, the frail beauty Solomei is represented dancing in a light embroidered gold dress for the despotic, wicked and envious King Herod. Her figure, curved in dance, with a hand raised in an imperative gesture, causes a desire to follow her will, from which even the king himself could not escape. The composition impresses with many colorful small details, which the artist depicted with some special persistence, thanks to which they turned out to be very realistic. The palace, which more closely resembles a medieval Catholic cathedral, which is not typical of that era, is depicted with high vaulted ceilings. The walls resemble colorfully decorated cathedral projections; a splendid red Persian carpet is spread on the floor, which seems to have been a little shabby from countless festivities and guests. Moro himself practiced mixing of styles in one canvas in almost all the paintings; this picture was not an exception either, which gives the impression that this palace can still be located somewhere in France, Assyria or Venice. In the story, Salome is mentioned at the death of John the Baptist, thus she is a real character who played a part in the death of the Son of God. Salome’s dance caused admiration, for which Herod bestowed on her one absolutely every wish, the dancer chose a dish with the head of the Baptist. What was left for the king? To fulfill the promise given to a beautiful but treacherous dancer. It is noteworthy that Solomeya on this canvas more closely resembles a resident not of the Far East, and not an image of Gospel legends.